It's almost rosé season (cue praise hand emoji) and for beauty lovers that means one thing: it's time for a new hair color—or at least a refresh. We asked Michael Bowman, Rob Peetoom advance stylist, and Kate Reid, global design director for Color.Me by Kevin.Murphy, to breakdown the hair color trends we should be trying in the warmer months. "Warmer tones will be everywhere this summer," says Bowman. "Think easy upkeep and non-committal looks." A warmer blonde hue (instead of platinum), like the one seen on supermodel Gigi Hadid, won't require bi-weekly salon appointments. After all, you shouldn't have to spend half the summer with foil in your hair. Reid describes stone as "a grey slate edge with a new smoky balayage color through the ends." It is also a great alternative for men who are looking to refresh color. Rose hair is still going strong. Reid says to pull off this look, go for a dusty rose if you have a cool skin tone. Rose-pink and rose-apricot will help warmer skin tones really glow. Bowman says golden brunettes work with nearly every skin complexion from fair to olive. "It’s all about the placement of the highlights or balayage," he says. "Highlights heavier in the front will look better on darker skin tones. With fairer skin tones, your colorist should disperse the highlights all throughout the hair to avoid the potential of looking washed out." Another bold color to try this summer: peppermint. The key to keeping color vibrant is good upkeep. "I like a refresh every six to eight weeks," says Reid. "Kevin.Murphy Colouring Angels has a line or warm and cool shades that work like a lip gloss to add beautiful tone and create amazing shine in-between salon visits. You just use them instead of your conditioner twice a week." Move over balayage, babylights, teasylights and foilyage, there’s a new colour trend in town and it will have you booking your next salon appointment ASAP! The great thing about this trend? It works with your existing hair colour and can be tailored to your own personal style. If you’ve ever wanted to try on a fashion shade but weren’t crazy about the placement or high maintenance aspect of it, the latest trend will bridge the gap between fantasy and reality. Colour lights are a unique way of adding a fashion shade to the hair in a more trendy light. “I love to work with fast fashion shades with colour lights, this technique is perfect for the type of client who wants to try a trend but isn’t ready to fully commit to the upkeep or maintenance,” says COLOR.ME by KEVIN.MURPHY Design Director, Kate Reid. Think of it as swapping out your regular highlight hue for a fashion shade instead. The process is similar and with the right home care tips, prolonging the shade between appointments is a breeze. Keep reading to learn more about the trend and how to get the look! In Tastemakers and Trendsetters, we talk to inspirational leaders in the world of spa, beauty, and wellness. 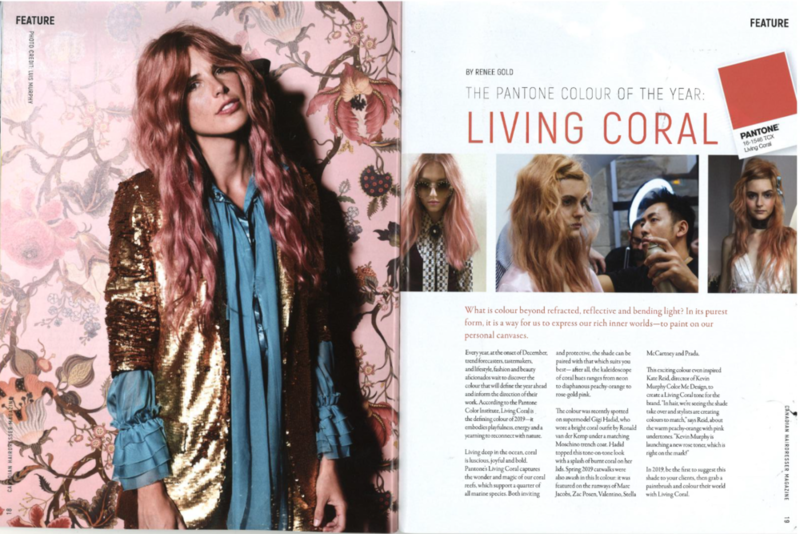 This week we chat with Kate Reid, Color.Me by Kevin.Murphy Global Design Director. Reid is a Finalist of Excellence in Education in the Australian Hair Fashion Awards for the third year in a row. After being chosen as a winner last year, her streak with the AHFA is a true testament to her passion for education, the hair craft, and always staying on top of the trends. Kate Reid, COLOR.ME by KEVIN.MURPHY Global Design Director has just been chosen as a Finalist of Excellence in Education in the Australian Hair Fashion Awards for the third year in a row. As one of the largest and most successful independent hairdressing awards the AHFAs are quite an honour. After being chosen as a winner last year, her streak with the AHFA is a true testament to her passion for education. Kate Reid explores the steps that got her to where she is now, and how being an educator has changed her life both personally and professionally. Keep reading to hear the top 5 reasons! The Great Debate: Is Hair Colour Safe During Pregnancy? When you’re pregnant, you have to say goodbye to some of your favourite things: sushi, wine, and retinol-based skincare products. But, do you really have to take a break from your colourist? We chatted with COLOR.ME by KEVIN.MURPHY Global Design Director Kate Reid ​to find out what she has to say about the topic. Fairly limited information is to be found but research indicates both semi and permanent colours are not highly toxic and are safe to use during pregnancy. But with such limited information available, what does one do about their hair colour? Which products are safe? Each colour brand is made differently and some are safer than others. Looking to celebrities like the Kardashians, at a distance they didn’t seem to stop getting Botox and facial fillers and their hair colour always looks fresh. You begin to question everything. What is okay and what will harm the baby? The truth is, it is very confusing and there is conflicting information out there. Valentine's Day date? Nah, we've found a dreamy hair color that'll make you want to skip the dinner on Feb. 14 and opt for a day at the salon instead. Introducing "sweetheart" hair: the adorable hair trend that features shades of pink with swirls of purple and gold, and it's as romantic as it is fun. Plus, since the candy love hearts aren't available this year, sweetheart hair is the next best thing to satisfy your craving. The color was created by Kate Reid, the design director for Color Me by Kevin Murphy, as an intense rose-pink shade that works with both cool and warm skin tones. Just like Valentine's Day and candy hearts, you can tailor a "call me" or "kiss me" hue just how you like it. Whether you want a short and sweet duration of pink dye or want the color to last until Spring and beyond, "sweetheart" hair is easy to tailor to your lifestyle. Reid suggested that if you want your hair to last for February and beyond, adding the Kevin Murphy Colouring Angels is like adding lip gloss to the hair; it adds shine and maintains tone. If you're ready for a change, you're in the right place. Celeb stylists and Instagram influencers are always inspiring the latest hair color trends. Here, we've captured our favorites — whether they're shockingly cool (Snow White hair, anyone?) or they just make the blondes, brunettes, and fiery redheads of the world look really, really good. After that, consider our short hair ideas, ombre inspo, and favorite braided hairstyles. Stylist Katie Reid is ready to bring Pantone's Color of the Year to your hair. Her iteration of "Living Coral" shown here, is a shade that works for all skin tones and works in medium blonde or lighter hair. "New pastels will be huge," Reid says. If you're blonde and feeling daring but noncommittal, Reid recommends using a demi-permanent color that will last up to 24 washes.